This black stanchion w/black & red retractable belt is a freestanding 38" tall crowd control fixture with a stylish wrinkle finish. 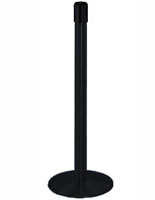 Each line post has a 13.5" diameter base for stability in high traffic public areas. 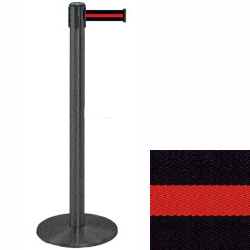 The wrinkle finish stanchion w/black & red retractable belt has a unique striped barrier that stands out in any environment. 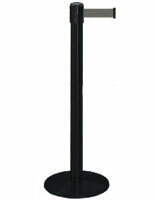 The high visibility crowd control accessory is modular and can be combined with other poles to create barricades of various sizes. 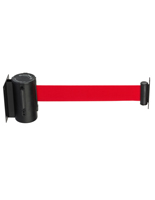 This eye-catching stanchion w/black & red retractable belt makes a great line management or access control barricade for commercial locations and businesses. 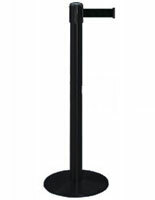 The striped barrier design offers high visibility in any environment.